Two vloggers from ChebuRussiaTV, a popular Russian YouTube channel which bills itself as “a project based solely on our enthusiasm and only positive intentions. Our purpose – to give people positive emotions and provide motivation to commit new crazy feats! 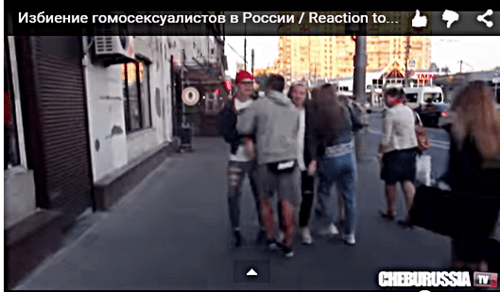 Prank, social experiments.” Conducted a hidden camera experiment that in which the two held hands and walked down the streets of Moscow and taped the outward anti-gay reactions of Russian citizens which ranged from curses to physical violence. The video has almost 1 million views at the time of this writing. Click on the closed captioning.